“I would like to challenge the conventional and popular perceptions about Afghanistan and expose a deeper story of commitment and determination, of struggle and success, of hope and change,” says Counterpart International’s Maiwand Rahyab in this week’s podcast. Today – almost 12 years after the United States and its allies invaded Afghanistan – is the next generation of Afghans better off? With 26 percent of girls giving birth before age 18, 1 in 10 Afghan children dying before the age of five, and young people leaving the country in large numbers, this seems like a fair question. In 2012, Rahyab co-founded Afghanistan 1400, a civil and political movement that empowers young people to influence Afghanistan’s social, economic, and political development. Working under the motto “our country, our responsibility,” the movement “is encapsulating the aspirations of the new generation,” says Rahyab. “If we are serious in our commitment to Afghanistan, we must look more broadly at how youth engagement, advocacy, and civic activism is being transformed,” he says. Increased youth participation is not a phenomenon unique to Afghanistan, but is a growing trend throughout the world. On World Population Day, representatives from history’s largest generation of young people came together to highlight the emergence of youth leadership in the international development sphere and underscore the importance of addressing youth engagement and priorities. 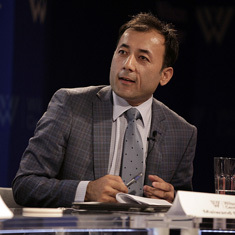 Rahyab spoke at the Wilson Center on June 24.